Finding coconut yoghurt, by this I mean the yoghurt made with coconut milk and not coconut flavoured dairy-milk yoghurt, has been a revolution for me. Suddenly I was able to enjoy overnight oats again – which I think are the most amazing way to have oats for breakfast. I could use it as a substitute for soured cream or creme fraiche in recipes and as a side. I would dollop it on top of my fig & frangipani tart (recipe forthcoming) instead of whipped cream. Truly revolutionary! My biggest hurdle… the tiny pots of around 125g, or 250g, were just too small to last very long. They were also upwards of 10 times the price of regular yoghurt. Which makes them extremely valuable when you do buy them. It is something I resent quite considerably, the price. I think I notice it more around the packaged alternative milks which have gone up in price by over 50% in the past couple of years. Demand, in this case, has made prices soar. Which is really upsetting for those of us who truly need to have this option. On the other hand, their popularity has made obtaining all these items extremely easy. Never has it been easier to have a food intolerance or allergy. All at a premium. Spurred on by economics, I was keen to start making my own coconut yoghurt. 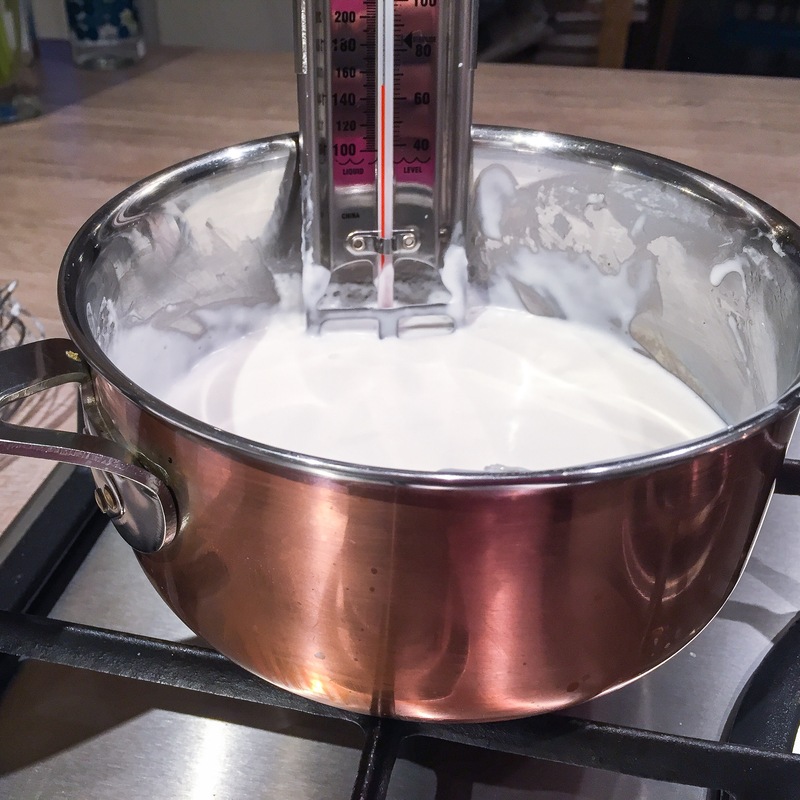 We have made dairy-milk yoghurt at home for years (for everyone else of course) and I much prefer it to the ‘lite’, gelatine and sugar infused versions which are so popular everywhere. I thought the whole process would be somewhat similar, and I wasn’t wrong. The big thing was choosing the ‘right’ ingredients. Unlike dairy-milk yoghurt, you need to add a thickener to your coconut milk in order to get a similar consistency to that of dairy-yoghurt – which is kind of the point here. There are different ways you can do this, tapioca starch and agar-agar being the more popular ways to approach this. Of course, if you are not vegan or vegetarian you could use gelatine, as I have read some people do. For me, I was happy to go with the tapioca starch. The coconut milk is the next big thing. I have tried LOTS of different types. I have also had LOTS of wasted coconut milk. The lovely stuff you drink the cartons, it turns out doesn’t make good yoghurt. It gets nice and thick when you add the tapioca, only to find out 8, 12 and even 24 hours later… it is runny as ever. Sure it is a bit sour like yoghurt, but the consistency changes and it really is not the way to go. I tried. I really tried. Especially as I really, really wanted a coconut almond milk yoghurt. Yeah. It didn’t happen. No matter what I tried. Much research brought us back to tins of coconut milk and here is where I stayed. Again I tried lots of different types of coconut milk in tins. A favourite of the many makers of coconut milk, is Arroy D. If you have an asian food shop nearby I would go there as the prices are much better than I have found online for the stuff. And truly, this brand makes a very lovely coconut milk. The ingredients are simply coconut and water (as per the tins I used, although I heard controversially that this might not be the case). I believe the percentage of coconut was good too. Although, once you start checking, you will be amazed at how bad some of them are! I was finding what was deemed to be ‘regular’ coconut milk (not the light stuff) would range from 30% all the way up to 80% actual coconut to water ratio. Along with a few additives as well. I also found my beloved powdered coconut milk actually contained dairy – which was most unexpected and disappointing. Even at that, I found different brands offered up completely different results. I really struggled to find anything worthy at our local Tesco shop, until the asian food section presented a high percentage coconut milk. I tried it, and quickly regretted it. The texture was gritty and nothing like I would have wanted for my yoghurt. A real dissappointment. Now, the yoghurt probiotic is key. I was recommended Nature’s Aid Super Strength Pro-30 Max. You can buy them on Amazon, I tried several health food shops to no avail. They are vegan and lactose, gluten and yeast free. All good. From my reading, it would seem you cannot do the scoop of yoghurt into your milk and use that bacteria, as you may do for dairy-yoghurt. I believe it has something to do with the nature of the coconut milk itself. However, if dairy is not an issue for you, I have also read you can use dairy milk yoghurt as a starter for the coconut milk, although I have not tried this myself. Do let me know if you try it. The final thing you will need is a thermometer for measuring the temperature of the coconut milk as you heat it and cool it. A sugar thermometer will work fine here. 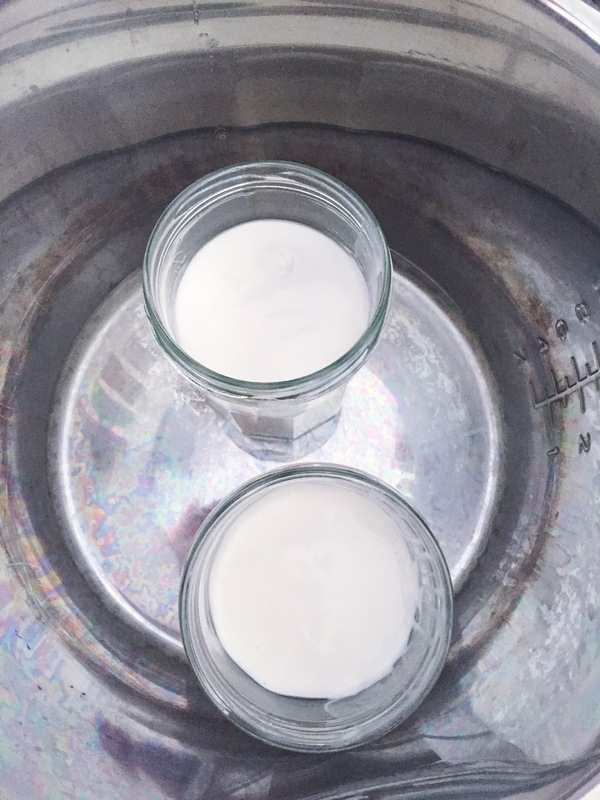 Shake your tin of milk and empty into a clean saucepan, reserve a small amount to mix with the tapioca starch and then whisk it all together in the saucepan. Slowly heat it over medium heat, whilst stirring, until the tapioca has thickened the milk. (It gets to around the 140F mark.) When thickened, remove from the heat and allow it to cool to 100F and then empty the probiotic capsules into the mix. Whisk to combine and add the sugar at this stage (if using). Allow to sit for at least 8 hours, and up to 24 hours. (I find 12 hours gives me a the thickness I like) The yoghurt should be tart and thick. The longer you leave it the tarter it will be. I found it worked best with a sweetener to feed the probiotic, as it helps to feed this. It wasn’t all that sweet, but if you are wanting the yoghurt for a savoury purpose then I would suggest reducing it or leaving it out altogether. 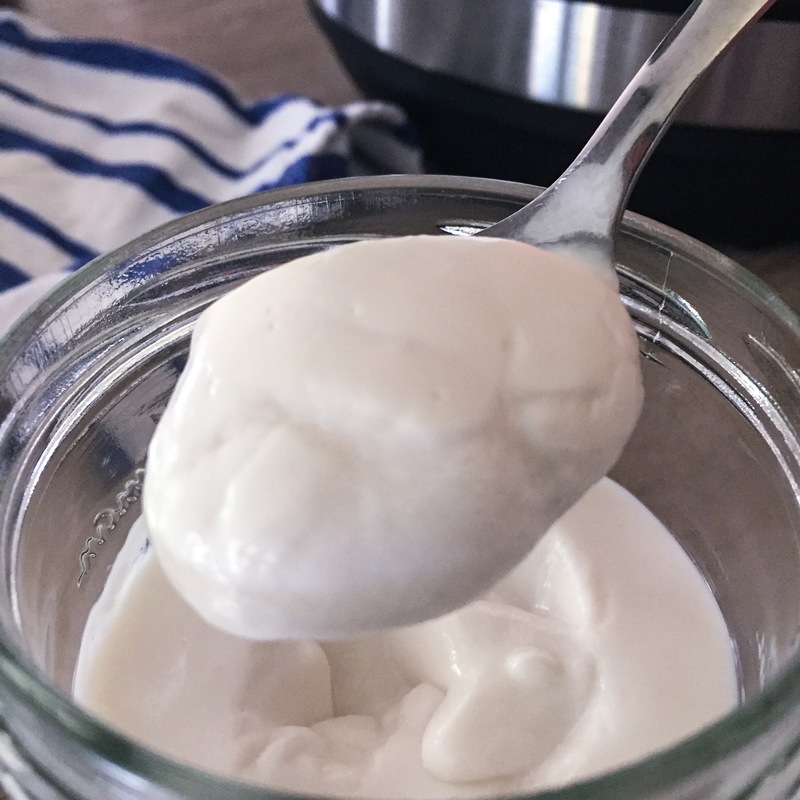 If you are wanting to make a vanilla flavoured yoghurt, which I must say is one of my favourites, Add in 1 tsp of vanilla paste when you are adding the probiotic and sugar. It will add a lovely flavour. The yoghurt should keep for 2 weeks in the fridge.